I have been on a beet kick lately (thumb cutting aside). I guess it is because I really love the flavour of it, and for once I found it in store (ergo, I had to buy). But once I had the bag of beets in-house, I had to figure out what to do with it all. I made chips. I juiced them (with pears, carrots, ginger and lemon juice) for breakfast twice in a row. And then came further experiments. For some reason, I really had a craving for beets, feta cheese and pesto together. The picture here doesn’t look all that appetizing – but this was yummy to eat. 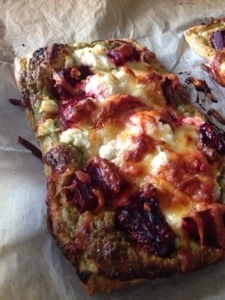 Sort of like a pizza, only with pesto and beets and feta cheese… oh, and store-bought puff pastry. I haven’t got the exact amount for the pesto and cheeses because it was mostly a case of throwing it on. This is a bit time-consuming in that I roasted the beets first. But that was mostly in the oven, with little work from me. a decent amount of pesto (enough to spread onto the puff pastry. a small handful of mozzarella cheese. 1. Cut off the top and bottom of the beets. 2. Pre-roasted them, in the oven for 45 minutes at 250 degrees celsius with a bit of salt on top. .
4. Peel beets and chop into smallish chunks. 5. Roll out puff pastry so that it is slightly thinner than just from the box. 6. Cover with pesto, a thin layer. Leave a small area around the edges. 7. Crumble feta cheese onto the pesto layer. 8. Add the beets on top. 9. Sprinkle mozzarella on top. 10. Bake in the oven as dictated by the puff pastry instructions, or 200 degrees for 15-20 minutes. (When the cheese turns bubbly and slightly brown, it should be ready).